A great way to spread the word about Being Green and Recycling is to give a gift made from Recycled Products. It is amazing the creative ways artist can recycle products. I attend a yearly event in Downtown Milwaukee dedicated to Recycled Gift Giving. RRRAGs Riverwest Random Recyclable Art & Gift Show - all proceeds go to the neighborhood arts department. 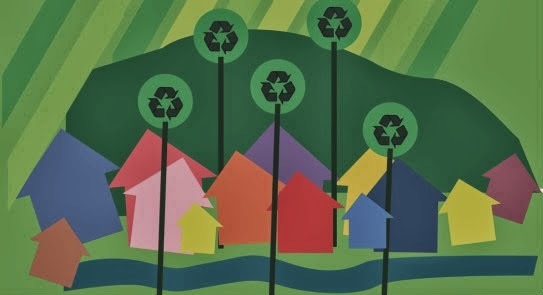 Check out your local events .... for great art work made from Recycled Products. If you live in the SE Wisconsin area...stop by to check out some very talented recycle artist and some great holiday fun! RRRAGS is a great local event which raises money to purchase art supplies and art programming for children in the Central City Neighborhoods of Riverwest and Harambe. Please join us for this neighborhood community event. Have some fun for the Holidays by purchasing and giving to a great cause all the while enjoying adult beverages at the Historic Falcon Bow. Support Sustainable artwork and practical items. Be a patriot, care for the EARTH, buy local, buy Riverwest!